As an observation, and most decidedly not a complaint, we note once again that as the blog delves deeper in the detail of Brexit, comments decrease – as do the number of visitors. This is not surprising. Apart from the nerds, people simply don't concern themselves in the details of governance and associated matters that do not directly affect their lives or interests. But in there lies a warning. Seeking to extricate ourselves from the European Union is like draining the catchment reservoir in flooded valley, prior to removing a dam that is no longer needed. As the waters recede, the shells of long-discarded buildings are revealed, along with the rotting stumps of forgotten forests, all to become a permanent feature of the landscape once more. So it is that issues which have long been hidden below the surface of the Brussels regulatory machine, ignored by UK regulators and businesses alike, are now becoming visible again and have to be dealt with. One of those issues – and a major one at that – is the formulation of technical standards for a wide range of goods and services, used to underpin legislation and as a marketing tool to reassure customers as to the quality of the products they are buying. In post-war UK, the dominant standard was the British Standards Institute (BSI), its "kitemark" a familiar adornment on the labels of high street goods. This built on the work of the world's very first standards institute which, as the Engineering Standards Committee founded in London in 1901, took upon itself the task of standardising steel tramways as its first endeavour. With the accession of the UK to the (then) EEC and the later advent of the Single Market, however, the British Standard was to give way to the European CE marking, a development about which the BSI is remarkably coy in its official hagiography. In fact, despite losing revenue formerly gained from the development of standards, the BSI did rather well out of our membership, becoming "our man in Europe", representing the UK interest on European standards bodies (CEN and CENELEC, now combined as CENELEC) as the official National Standards Body. Formalising the relationship with a Memorandum of Understanding with the Government, the BSI gets a generous subsidy from the taxpayer, currently £4 million in 2015-16, down from £7 million in 2006-7. Additionally, it gets handsome annual payments from the EU (nearly €7 million in 2014), for "services rendered". The government subsidies have given the BSI space to reinvent itself as a testing house and an EU-approved "notified body" for 13 separate regulations. And now, with the fees flowing in and the revenue from overseas acquisitions, in 2016 it reported record profits of £35.4 million on a turnover of £331 million. For a modern, services orientated Britain, the BSI and other such "notified bodies" are precisely the sort of businesses the Government wants. 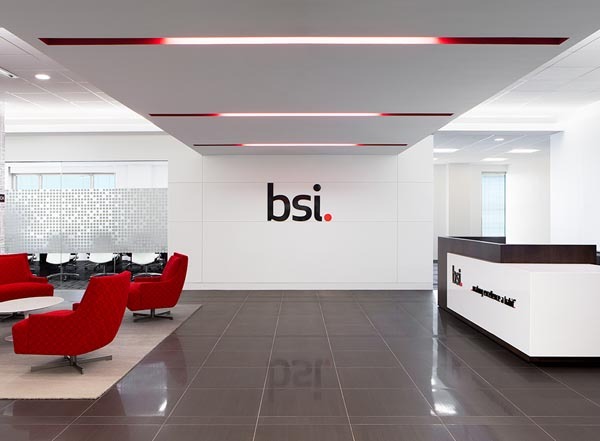 Operating out of its headquarters in Chiswick, the BSI has 3,500 employees and maintains 76 offices worldwide, reaching 80,000 clients across 182 countries. In purely value terms, the "standards industry" is worth far more than the half-billion or so delivered by the fishing industry, creating high-value white-collar jobs, dominating a growing sector with high export potential. However, with Brexit on the horizon, two substantial clouds are looming, with more than enough potential to rain on BSI's parade. The first is specific to the BSI as the UK representative on CENELEC, from which it profits so handsomely – and from which participation it gains both intelligence and prestige. At the moment, the organisation is maintaining a stiff upper lip, declaring after the referendum that it is "business as usual". Over the coming months and during the transition period that will follow the triggering of Article 50, it says, we will be working with UK government and other parties as appropriate, such as the European institutions, and CENELEC, regarding our role in the development of European standards. It is BSI's ambition, it adds - "on behalf of UK stakeholders for the UK", of course - to continue to participate in the European standards system as a full member of CEN and CENELEC post-Brexit. At first sight, it looks as if the BSI's ambition is not at all unreasonable. Although CEN and CENELEC are European institutions, closely related to the EU, EU membership is not a requirement for full membership. Currently, the 34 members include Turkey, Serbia and Macedonia, as well as three Efta states. However, the current guidance on membership criteria sets six main points with which a candidate organisation must comply. Then, crucially, a candidate must have the "capability of becoming a member of EU or EFTA". This leads to three additional criteria, the first one of which states that there must be a "Europe Agreement" (or equivalent) between EU/EFTA and the candidate country, specifying a transitional period for accession to EU/EFTA. Normally, it states, "an application for full membership can be considered only if target dates for accession to the EU/EFTA have been established". What we then have are the Internal Regulations which state that CEN/ELEC is a European Standardization Organization, operating within the framework of EU Regulation 1025/2012 "whose members are joint-producers and disseminators of market-driven European Standards". Within Regulation 1025/2012 is defined the role of the National Standardisation Body – the role taken by the BSI – making the collective bodies responsible to the European Commission, and imposing duties on Member States in relation to these bodies. It is hard therefore, to see how the BSI could operate effectively (or at all) within CENELEC without the UK also being an EU Member State (or at least an Efta/EEA member). What the BSI can't avoid is that, post-Brexit, there will have been a change in its legal status - and not, as far as it is concerned - for the better. This is dealt with in the CEN Statute (Article 10) which states that any national Member "will be regarded as having resigned" if, inter alia, they "lose their qualification as a separate legal entity" or "no longer fulfil the conditions required in order to be a national member". In all cases, a ruling is made by the General Assembly, against which there is no appeal. Nor, indeed, can CENELEC turn a blind eye. Responding to a request in 2008 from the European Council, CENELEC set up a Working Group on Membership Criteria to keep conformity with membership criteria under review, which means that the BSI's new status will come under formal review and trigger action. Nevertheless, this did not stop Scott Steedman, Director of Standards at the BSI, writing to committee members after the Referendum, stating that, "for the foreseeable future we see no change to BSI's status and obligations as a full member of CEN and CENELEC". Posted by a member, the letter asserts the BSI's "ambition" that the UK should continue to participate in the European Standardization System as a full member of CEN and CENELEC. But Steedman then goes on to say: "We consider that this is a likely outcome of the forthcoming negotiations between the UK and the EU". It is hard, though, to see how Steedman can be right, although the issue is discussed more widely here. At the very least, he is being wildly optimistic. All that BSI might actually aspire to is a partnership agreement, which confers no voting rights. Our experts would be afforded only "observer" status on technical committees. For a UK perspective, though, full CENELEC membership it is hardly in accordance with the spirit of Brexit. The issue here is that CENELEC, when instructed by the European Commission via a set procedure, is required to produce harmonising standards and, once adopted, all the nation bodies must withdraw their own. Retaining full membership would keep open a back door, by which the EU could continue to impose its standards on the UK. Whether or not BSI continues as a full member of CENELEC, therefore, needs to be a political decision – in the first instance by the UK Government. Then, it would require CENELEC to change its own rules, which would have to be negotiated. Doubtless, the European Commission would have the last word. This, then, presents another series of policy decisions to be made by Mr Davis and his department, and ultimately by Mrs May. But there is then the issue of "notified bodies", which must also be addressed at a policy level. Essentially, for existing UK bodies to continue certifying EU standards, the UK Government will have to negotiate a comprehensive Mutual Recognition Agreement (MRA) on conformity assessment, along the lines agreed with Switzerland. EU attitudes would probably be influence by our commitment (or otherwise) to CENELEC. Alternatively, as we saw yesterday, the UK could decide to abandon the European system altogether, and throw its weight behind global standard-setting organisations, in particular ISO and IEC, seeking to work on the basis of equivalence. In the short-term, that approach would cause major disruption in the "standards industry", with a significant cost element and even job losses. Refusal of the Commission to play ball would leave some sectors with considerable extra costs in seeking approval from EU standards bodies. Divergence would add to costs, as manufacturers have to gear up to a dual standard environment. Either way, significant input from Government is going to be needed, adding to the realisation articulated by one commentator that breaking up is hard to do.